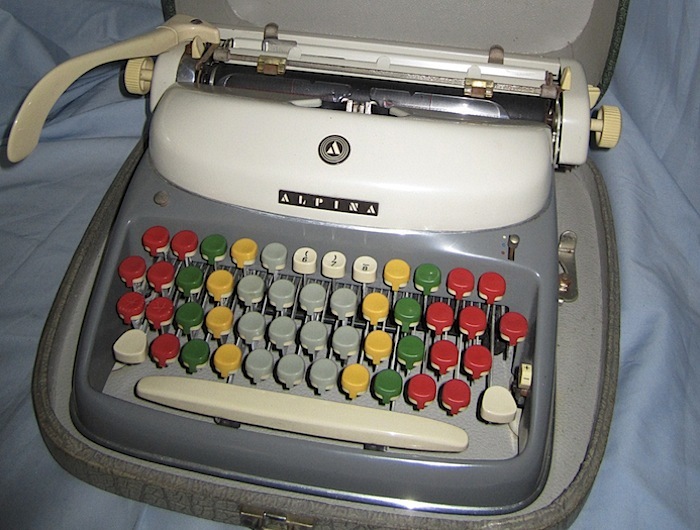 The Alpina typewriter, a West German make, was marketed in the United States as AMC or Avona at Jordan Marsh department stores.1 As portables go, this machine is heavy. Robert Messenger at oz.Typwriter describes the Alpina as “semi-portable,” and that is certainly an apt description. I must admit that when I received my AMC in the mail, I was taken aback. It looked pretty and petite in the photos, but it is a much larger machine. 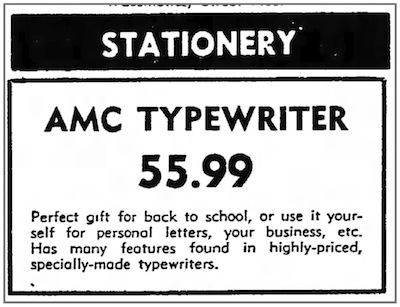 That said, the AMC is stylish, to the point of astonishment — I spend more time admiring it than typing. Its vast, roundish proportions remind me considerably of 1950s automobile styling. 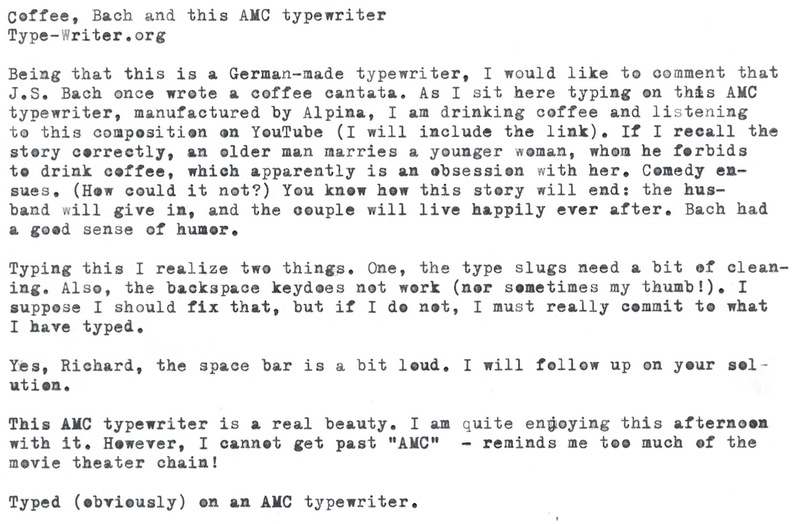 One can really go places with this typewriter. In terms of build quality, the AMC is mostly metal, with some hard plastic components. The carriage return lever, a swooping cream colored element, is made of plastic, but has a very solid feel. The keys amplify the sense of roundness this machine embodies. The AMC is a sweet machine. Richard Polt offers an Alpina manual here, and includes a photo of his AMC here. Robert Messenger of oz.Typewriter offers several postings here. One last bit of interesting reading comes from Will Davis’ web pages: PORTABLE TYPEWRITER RELABELING…how and why. Simply put, not all AMCs are Alpinas. Note: See comments for context. Great review of the AMC/Alpina, especially appreciated the video. A typing sample/typecast would go well with this review. Congratulations! These are neat typewriters and you don’t see them every day in the US. Your space bar sounds noisy. You might try getting a sheet of self-adhesive felt at a craft store. Then you just snip off a couple of tiny squares and attached them to the contact points between the space bar and the front frame. It makes a big difference. Yes. But I thought it was my heavy thumb! Will give your suggestion a try. This AMC is one of my happiest acquisitions. Thanks for the typecast, Mark. I’m sure the smudging is an easy fix. By the way, I also like it that your machine is the re-labeled “AMC” version, I think that’s even more rare than Alpina, which pops up on ebay and etsy with some regularity. These are splendid looking machines. Indeed, the style used to manufacture these beautiful machines is astonishing. It is a absolute shame that computers these days can’t have a spark of taste in them. It is a pity. However, i love the “gigantic” carriage return. Some of the newer portables have the issue of a very small carriage return, by which you will need to reach for it several times. It would fit wonderfully with the 60’s and 70’s decor. Truely a spiffing find. Congratulations. Unfortunately, mine is packed up in storage, but I do recall it being relatively easy to find. Just can’t recall where to look. 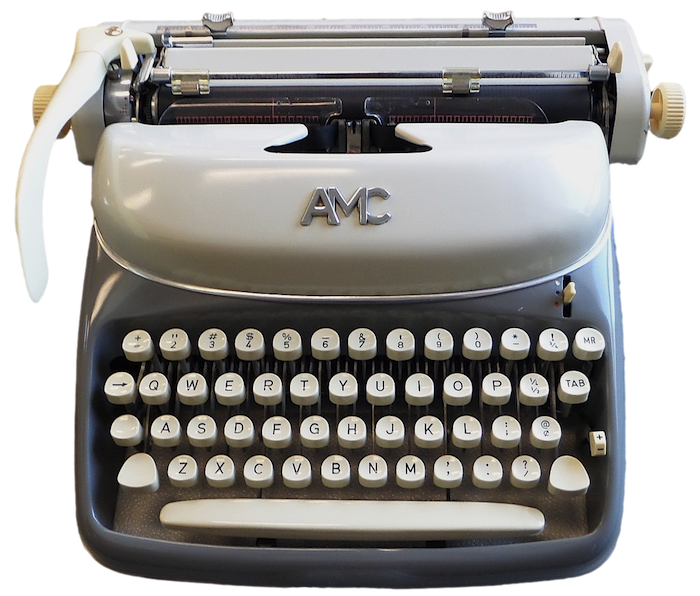 Please what is the upc number for amc manual typewriter? Hi. I just found this typewriter at a thrift store yesterday. Was going to throw it on eBay – so I started doing some research. Where do I locate the serial number on this machine? I am a newby to vintage typewriters. I can’t find the serial number. So anyway……just listed it on eBay. Hope it goes well! Yes, saw your listing. Looks like a very fine machine. Sorry, don’t know where to find serial number. I gave mine away to an aspiring typist. Wonderful machine! Just Got one myself.